Cheryl @Meadow Mist Designs released the September instructions for the Midnight Mystery Quilt last Thursday. The directions call to make 34 square in a square blocks, and I broke up the piecing over a few days to get them all completed. 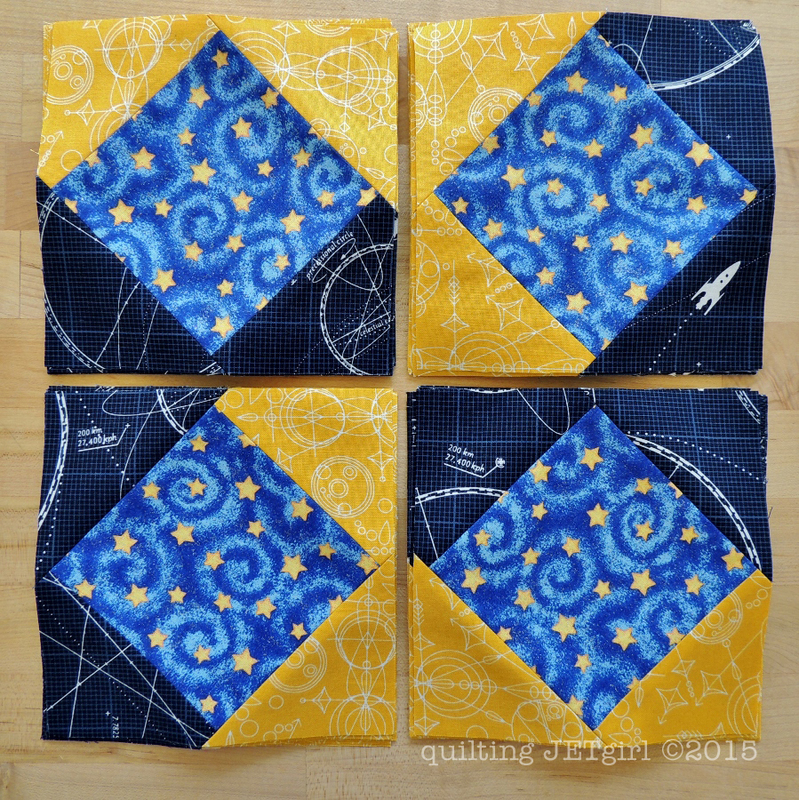 I have to admit that I really enjoyed making these blocks because they combine 3 of the fabrics for the quilt and I am really happy with how they look together (I will be keeping this quilt for snuggling on my couch). It took me 2 hours and 20 minutes to make the 34 blocks. I started by piecing 2 blocks entirely to make sure I would be able to trim down to size. Then I worked in 4 batches of 8 blocks to keep momentum moving along. The fabric is so you. The fabrics do look great together Yvonne. I’m looking forward to being able to start mine for precisely that reason – seeing three of the fabrics together will give a better idea of how the quilt is developing. Great prints! I really love the dark blue print – so fun! Such great fabrics together! I love the little rocket – so you! Your blocks look great! I enjoy seeing your progress on the mystery quilt. Your fabrics look great together. Need to make time to make my own. Yours look great. I still need to sit down and figure out what I’m doing on this set of instructions. Since I peeked and know what the finished quilt looks like, it’s confusing me more because the colors in the finished rendering is different that the colors used in the instructions. So I need to make notes what each color should be and then I have to translate it to what colors I’m using. AND, since I’m enlarging for a queen size quilt, I need to do some additional math. That’s why I have to cut my fabric as I go. I love how this is coming together! Maybe next year I will do a mystery quilt, they look like fun. the blocks look great. I finished my over the weekend, and am very happy with how they turned out. I’m really loving those fabrics together more and more, glad you’ve decided to keep this one, it’s very ‘you’.